Italy's supreme court has ruled Romano Prodi the country's election winner, after the result was challenged by Prime Minister Silvio Berlusconi. Mr Berlusconi made no comment after the ruling, but his aides said he was still refusing to concede. The court confirmed a narrow win for centre-left opposition leader Mr Prodi, nine days after polls closed, after reviewing disputed ballots. Mr Prodi said there were "no further doubts about our victory". "We will work to deserve the trust that our voters have shown us and to earn the trust of those who have legitimately decided to vote for the other coalition," the 66-year-old Mr Prodi said. 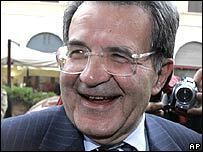 Asked if he had received a telephone call from Mr Berlusconi, Mr Prodi said: "I'm waiting." The serving Economy Minister, Giulio Tremonti, a close ally of Mr Berlusconi, said he still did not recognise the court's ruling and called for further checks. But one of the parties in the centre-right coalition, the UDC party, has broken ranks and admitted defeat. Mr Berlusconi could mount a legal challenge in the days to come but he may find himself increasingly isolated by his coalition partners, correspondents say. However some analysts believe Mr Berlusconi is simply trying to undermine Mr Prodi's government-in-waiting, hoping it will be short-lived - in effect, conducting the next election campaign. The Corte di Cassazione reviewed 5,200 ballots not immediately included in the overall count, as the voting intentions were not clear. It ruled that Mr Prodi had won the lower house by a margin of some 24,000 votes - a similar margin to the one previously announced. Mr Berlusconi's allies had urged the court not to rush the checking of the ballots and to give a verdict "beyond any reasonable doubt". Mr Prodi claimed victory in the polls after official results showed he had won just enough seats to control the Senate (upper house) after having already won a lower house majority. A review of contested ballots in the Senate is still under way. The new parliament is scheduled to convene on 28 April. Although the court ruling means Mr Prodi can work on forming a government, it cannot be sworn in for a month. Italian President Carlo Azeglio Ciampi has said he will not seek a second term when his seven year-mandate ends in mid-May. His departure means Mr Prodi will have to wait until parliament elects a new president before his government can be sworn in and he can be made prime minister. Under the constitution, the president must give the mandate to form a government, and Mr Ciampi has already said he will leave the task to his successor.